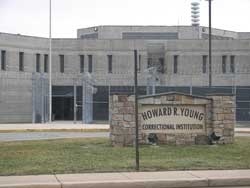 Howard R. Young Correctional Institution is located in Wilmington Delaware. It is also known as Gander Hill Prison. It is a level 5 facility that houses approximately 1,500 inmates. This facility currently classifies and processes the majority of inmates in Delaware. The prison itself houses both long term commitments and pre-trial inmates who are either awaiting sentencing or have not yet made bail. You must have an approved visitors application on file prior to your visit. You must call the visiting office desk up to one week in advance Monday-Friday from 8am-3pm at 302-575-0330 to schedule your visiting appointment. The visiting days and hours for this facility are everyday in one hours blocks starting at 8:30am, 9:30am, 10:30am, 11:30am, 12:30pm, 1:30pm, and 2:30pm. You must arrive at least 15 minutes prior to the start of the visiting block. Up to two adults and two children may visit. Children over 14 must have a valid photo ID, either state issued such as an ID, drivers license or passport or a photo school ID. The birth date, address, telephone number, and name of each visitors, as well as the inmates full name and ID number must be known to schedule a visit, please do not call unless you have all of this information. You can bring up to $5 in small bills to visitation for the vending machines. Money orders for inmates will not be processed at visitation, instead they should be mailed in.